The headline reads "Baby Houdini, Holder of the South American Underwater Swimming Title" on the cover of the June 22, 1921 edition of the Riverside Enterprise Newspaper. This young girl is Alma Mann and she is 11 years old in the photo above. She made a name for herself as a championship swimmer and diver. But she also included underwater escape stunts ala Houdini. Alma Mann was from the Canal Zone in Panama. She was apparently quite the sensation down there and eventually came to NYC with her Canal Zone Swim Team to compete in swimming events and do exhibitions at the new Madison Square Garden Pool. At home, Alma was the first person to swim the Culebra Cut near the Panama Canal and she broke the ladies speed record of walking across the Isthmus (from Ocean to Ocean) a distance of 50 miles, in only 16 hours. She did this at the age of 12. Where she discovered her skills as an escape artist is unclear. She was obviously a tremendous swimmer and athlete at a very young age. The addition of underwater escapes did help her to get media coverage that other girls her age were not getting, so perhaps that was the sole reason she did them. One of her stunts was to dive from a height of forty feet while bound in 70 feet of rope. She would remain underwater until she was completely free. 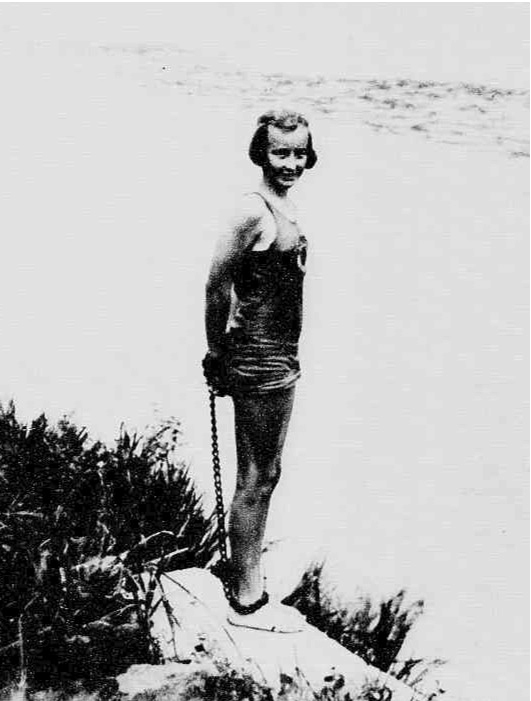 She continued to get press from her swimming and escapes stunts for a couple years and then my guess is she went back to an ordinary life as I could not find any other newspaper articles on her. She was never really a Houdini competitor, as far as I can tell she never worked vaudeville. She only added the escape stunts to help promote her swimming and diving exhibitions. I can't imagine an eleven year old even being allowed to attempt such a thing today, but this was back in the 1920s, definitely a different time. Thanks Joe. I actually had that one too. She swam until age 13 as far as I can tell. Don't know what she did after with swimming or escapes.